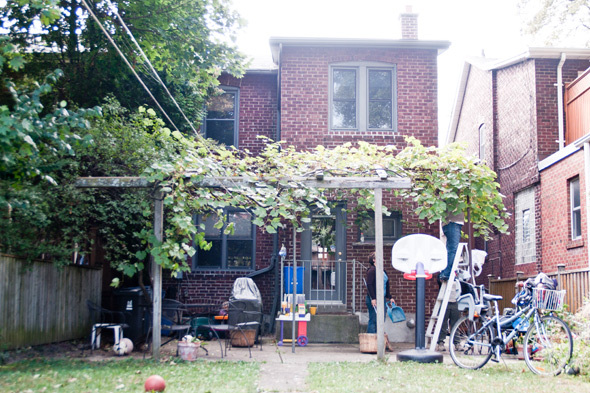 Not Far From the Tree is an organization of do-gooding gleaners who pluck away the plump fruit from urban homesteads across Toronto and give it to a worthy cause. It's a win-win-win situation that spreads good will and fresh fruit to everyone involved. Basically, here's the deal: one can take part two ways, either as a tree owner, or as a gleaner (a fruit picker). Those lucky enough to have a mature, fruit bearing tree on their property need do no more than let the good people at Not Far From the Tree know about it and offer up its bounty. Those without such good fortune (like myself) can make themselves available to harvest those luscious fruit-filled branches and vines. Once the harvest is complete, the haul is divided three ways: one-third to the tree owner, one-third to the gleaners and one-third to charity. It saves home owners from a sticky, stained mess of rotting fruit in their backyard, builds community among those involved and provides fresh fruit to a needy cause — win, win, win. My inaugural gleaning experience began with a hefty bike ride north. As a South-of-Bloor kind of guy, I often forget the treacherous terrain that lies in the badlands of St. Clair West — crooked, meandering roads; extended patches of unleveled, rolling green-space; and enormous, mature oak trees blocking out the sun that would otherwise grace the oversized residential lots. Regardless, I made it to a lovely home just north of St. Clair and Vaughan Road with enough time to refuel at Dutch Dreams before the harvest. Once my ice cream levels had been equalized, I made my way to the back to meet the team. The supreme gleaner (that's the real title) for this mission is Malgosia Halliop, a long time volunteer and neighbourhood local. I was the first peon to arrive, but was soon joined by two others to harvest today's bounty: grapes. The first thing we did was familiarize ourselves with the crop (that means we ate some). 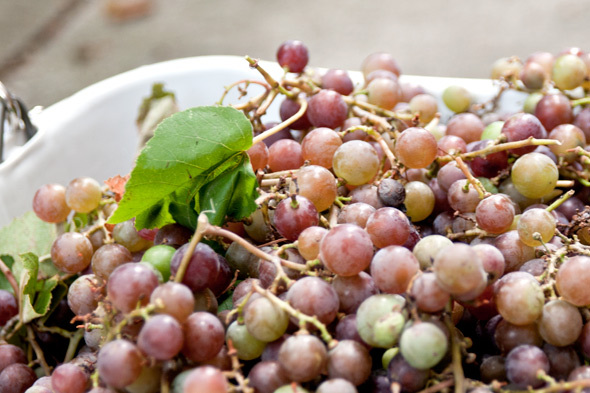 Backyard grapes are much different from the standard grocery store variety, the skins are much thicker, the insides more gelatinous and the flavour more complex. These grapes reminded me vaguely of lychee fruit both in texture and flavour, but with a distinct sourness balancing out the sugars. They're also much smaller than Loblaws grapes and wear their imperfections on their sleeve which I chose to read as a sign of their unmatched authenticity. 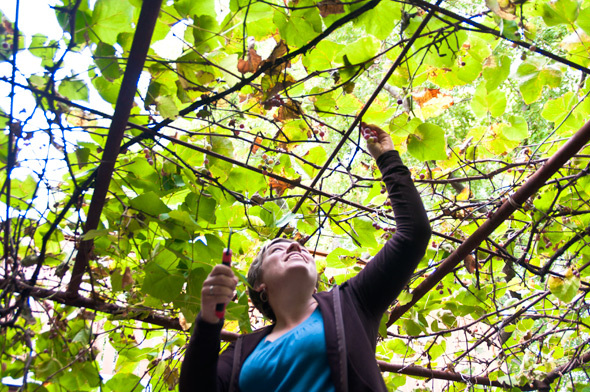 For things like apples and pears, NFFTT has cool harvest gadgets affixed to long poles to pluck the delicate fruits from high above and return them to earth with nary a scratch, but grapes need a little more care. Admittedly, my expertise is scant in the area, but I'd venture to say that backyard grape picking technology has remained stagnant for the past - oh - millennia or so. 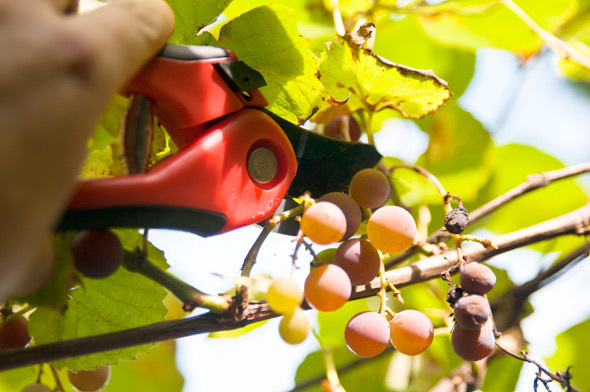 Ok, when were pruning shears invented? That's when the great grape picking minds gave up and said, "that'll do." Not that things are lacking of course, to clear a grape vine one needs three things: a ladder, some pruning shears and a vessel in which to hold your rewards. If you're into things like safety (boring! ), you also need a human being to hold the ladder for you--and maybe chat with, but that's basically it. Generally, picks last about two hours and are scheduled any day of the week between roughly 10am - 8pm. Once you're on the list your inbox will be inundated with opportunities, but you've got to sign up quick because gleaners are eager people and the spots disappear in a flash. Unfortunately, the harvest has been fairly light this year. Imperfect growing conditions during pollination season, combined with a nasty tree fungus have left this year's urban haul a scant fraction of years passed. On first look, today's vines looked a little bare as well, but I quickly learned my eye for the harvest is untrained. In a quick hour the vines were bare and we were all headed home with bushels. I left with a big bag of fresh grapes; more than I could possibly eat before they went bad so I decided to make grape juice, which was super simple and pretty fun. First I just squeezed the juice through a sieve with the blunt end of a ladle, which produced a really tasty, fresh flavoured juice. But then I got to thinking how much flavour was probably still stuck inside all that pulp and seeds and skins so I added a bit of water and simmered it a while. The result was really tanning and had the vague flavour of apple juice, which is super delicious. Rumour has is they also tap Maple trees for syrup, which is just about the greatest thing I can imagine and has inspired me to plant a forest of trees on my back patio — we'll see what the bakery below thinks.